I’m not a Regency romance author or a historical romance author. 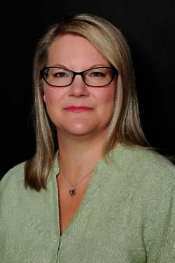 I’m a romantic suspense author. 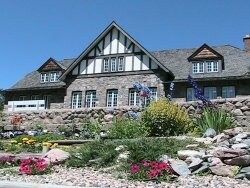 But I do love history and Lesley has been kind enough to invite me to share my thoughts on one of my favorite places and the area that became the inspiration for my fictional town of Aspen Lake. I am fascinated by the history of the province I call home. I love hearing the stories of the First Nations people, tales of the North West Mounted Police, the escapades of the fur traders, and the triumphs and trials of the European immigrants. Even as a contemporary writer, history has a place in my writing. I need to know a bit about the history of a place to get a sense of it as its own character. Just as characters have backstory, so do settings. My debut release Backlash is set in the southeastern part of Saskatchewan, a western province of Canada. My fictional town of Aspen Lake is based on the Moose Mountain Provincial Park and Kenosee Lake area. The word 'mountain' is deceiving. It’s really hills that rise from the surrounding prairies: an elevated plateau of aspen forest, rolling hills, lakes and ponds. It’s a beautiful part of the province and I have many happy childhood memories of visiting the beach for the day or camping there for a couple of nights. My love affair began at an early age. As a teenager I worked for the park in a historic stone chalet with beautifully terraced gardens that led down to the lake. It really is the center-piece of the park. The two-story structure was built in the Dirty ‘30’s of the 20th century. Its construction provided much needed employment, giving work to over 300 people. It was originally a thirteen-room hotel with a dining room and beer parlour. When I worked there it had already been converted to administrative offices but you could feel the history every time you walked through the front door. Often I worked the evening shift. In the quiet I sometimes sat and tried to picture it as it was back then, a bustling dining room, and rooms with beds and washstands. The same rooms that I knew as offices. What would the women be wearing? The men? The staff? The area would have been a popular recreation spot as far back as the 1880’s and used by the residents of a nearby village called Cannington Manor. Cannington Manor is a historic park a fifteen minute car ride away. 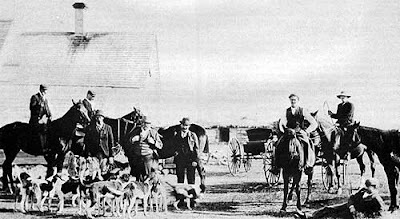 It was settled by a middle-class Englishman, Captain Edward Mitchell Pierce, who had likely been encouraged by the Canadian government’s desire to welcome good English families to the prairies. Ones who would bring their Victorian type of lifestyle with them. Among other endeavors, Captain Pierce came up with the idea of setting up an agricultural college for the sons of wealthy Englishmen. Alas, it’s hard to pull that off when you don’t know much about farming yourself. The wild and harsh prairie was not Victorian England. The sons, or ‘pups’ as he called his pupils, weren’t very interested in learning the ins and outs of farming. Three of these sons, funded by money from back home, did however manage to build a large many-roomed house complete with a ballroom, billiard room, and servant’s quarters. Their racehorses also lived in style in a mahogany-lined stable with brass name plates over their stalls. They did indeed bring their interests with them and they indulged in pursuits like fox hunting, cricket, and playing polo rather than planting and harvesting. Their eccentric lifestyle is the stuff of prairie legends. Grain prices fell. Harsh conditions and drought destroyed crops. Business and farm bankruptcy followed. When the Canadian Pacific Railroad bypassed the village in the early 1900’s it spelled the end of an unrealistic ideal. Many of the wealthier formerly-English residents moved away and took their money with them. Soon Cannington Manor was all but abandoned. The working class farmers who had worked for the English families stayed. They were the ones with actual agricultural expertise. They persevered and succeeded after the village declined. It is these hardy men and women who embodied the philosophy of hard work, fortitude, and teamwork. They are the lesser known stars of this Victorian drama. They represented what it took to survive on the prairies in the latter part of the 19th century and continue to prosper into the twentieth century. Sturdy prairie stock. All Saints Anglican Church is one of the original buildings left at Cannington Manor. It is still used today. We circle back round to contemporary times. To love a place is to know a place. Do you have a favorite place whose history fascinates you? I grew up on a farm in the middle of Canada's breadbasket. Under the canopy of crisp blue prairie skies I read books. Lots and lots of books. Occasionally, I picked up a pen and paper or tapped out a few meagre pages of a story on a keyboard and dreamed of becoming a writer when I grew up. One day the inevitable happened and I knew without question the time was right. What to write was never the issue--romance and the gut wrenching journey towards forever. Sumptuous, indeed! The quantities in the cookbook are substantial, the ingredients are the finest, and sometimes exotic, and every receipt is labour-intensive. I do not profess to give any hackneyed receipts for boiling or roasting, broiling or baking, but have confined my selection chiefly to the higher departments of the art, such as made dishes, ragouts, fricassees, soups, etc. ...are there not thousands of Opulent Families, both in town and country, who wish to give handsome occasional entertainments to their select friends; and who, on such occasions, are not so scrupulous of the expense? Such families would no doubt serve Soup a l'Ecrevisse which calls for one hundred fresh crayfish, a lobster, four pounds of mutton, anchovy and a variety of vegetables. The preparation time must have been at least two hours requiring several staff, and cooking time was forty minutes. Sauce Tourney is a sort of gravy made with ham, chicken, veal and mushrooms. Sweets are not forgotten in this noble recipe book, although Mr. Nutt had published the very successful The Complete Confectioner in 1789. The fact that Mr. Nutt apprenticed with confectioners Negri and Whitton is one of the few details we know about him. Darioles, apparently named after their mold shape, are puff pasty filled with custard. Peu d'Amours are puff paste shapes adorned with sweetmeats. Put puff-paste round the dish, then a layer of biscuits, a layer of butter and marrow, another of all sorts of sweet-meats, and so on. till the dish is full; boil a quart of cream, thicken it with eggs, put in a spoonful of orange-flour[sic]-water, sweeten with sugar, pour it over the whole, and bake it half an hour. "this book is not adapted for families in general; the receipts are too expensive." 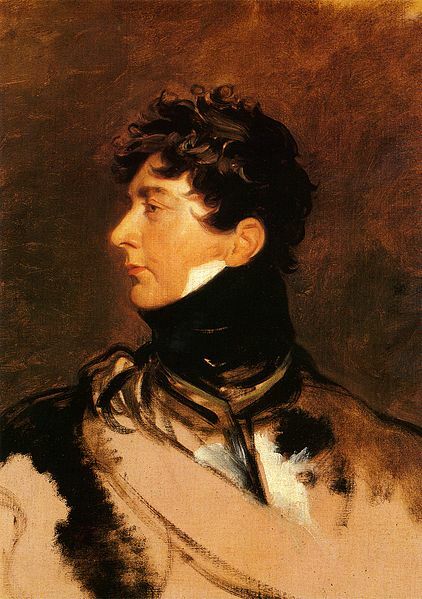 "it is only in the first families of rank and fashion that these things are to be found." The jaded palates of the wealthy were, presumably, tempted by these delicacies. I would myself prefer a simple stew! *The Imperial and Royal Cook is available as a free download from Google Books. In my blog post of August 24, I promised more information on The Monthly, and The New Monthly, Magazines of Regency times. I became confused when doing the research for that post, about the magazines. I didn't realize at first that there were two distinct publications. The Monthly Magazine was started in 1796 by Richard Phillips (1867-1840), an educator, author, and radical politician. His political leanings got him into trouble in Leicester where he was working in about 1795, and he returned to London, where he amassed a fortune writing and publishing textbooks. 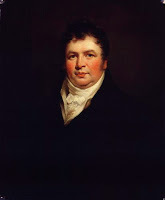 This portrait was painted in 1806 when he was at the height of his prosperity; a year later he was knighted. In the Bank Panic of 1825 he lost his money, and was declared a bankrupt. The Monthly Magazine was probably his greatest success--it was a forum for his political views, and a popular publication under the editorship of Dr. John Aiken for the first ten years. The cover page from an 1805 edition displays the breadth of the material covered. Political items displayed radical leanings with articles by William Godwin and Thomas Holcroft. Other material was written by now eminent names in British literature: William Blake, Samuel Taylor Coleridge and Charles Lamb. By 1814, Henry Colburn (1784-1855), a bookseller and later publisher, had had enough of Phillips' radicalism. He began The New Monthly Magazine, which reflected his Tory bias. I am astonished by the level of similarity between the two journals. Neither have much in the way of illustration, unlike the Repository of Arts of the same period. It would appear that Colburn directly copied Phillips' content and changed the wording a little on his title page. Both journals relied heavily on reader input, but one wonders if these were genuine letters submitted by the public, or in-house commentary, thinly disguised. A reader of The New Monthly Magazine in 1814 was busy condemning another magazine for its viewpoint. I have read The Edinburgh Review and really don't understand the letter-writer's concern. The Monthly Magazine ended publication in 1843, three years after Phillips' death. The New Monthly Magazine gained a greater emphasis on literature after 1821 becoming The New Monthly Magazine and Literary Journal, and it continued in various guises until 1884. The quantity and variety of journals published in the Regency never ceases to amaze me. And their contents continue to delight. With my confusion over these two magazines sorted out, I'm going back to reading them! I was struck by its formality, its obviously eminent subject matter, and the detail of its presentation. I hope you will click on the picture to view it in a larger format--this small version does not do it justice. The Queen Consort of Prussia was Duchess Louise of Mecklenburg-Strelitz (born Luise Auguste Wilhelmine Amalie 10 March 1776). She married Crown Prince Frederick William of Prussia in 1793 and born him nine children until her early death in 1810. She was a politically active consort after the Crown Prince succeeded as King of Prussia, a beautiful and intelligent woman of, by all accounts, great ability. I believe she is wearing the same diadem in the picture above as in the large Plate. The King of Prussia Frederick William III was, it seems an ineffectual ruler. The Explanation accompanying the Plate, describes him as "...decidedly in favour of of a pacific system, in other words, of a system of compromise and expediency..."
He is, I believe, the right-hand figure of the two central men. Emperor Alexander of Russia had succeeded only a year before to his throne, on the death of his father by assassination. He was only 24 at the time of his coronation, full of enthusiasm, and a mass of contradictions. Metternich thought him a madman, Jefferson believed him a 'man of estimable character' and Castlereagh thought him 'suspicious and undecided'. Bonaparte called him "a shifty Byzantine". And Napoleon Bonaparte was what this meeting was all about. The Prussians and the Russians entered into an alliance intended to deal with Bonaparte. In a staggeringly inept fashion, first supporting France, then opposing Napoleon's aims, occasionally protected by the French dictator then oppressed and conquered by him, the two countries reeled through the next twelve years, sometimes in concert, sometimes in opposition. I must admit that the politics of the meeting are not of paramount interest to me. The representation of the encounter and the additional characters are. The elder lady on the far left of the Plate is noted as Countess Vonness. I have been unable to find any information about her; presumably she was a sort of lady-in-waiting. The two uniformed gentlemen on the far right are listed as Prince William and Prince Henry of Prussia, brothers of the King. Their anglicized names are more correctly Prince Wilhelm who lived from 1783 to 1851 and Prince Heinrich Friedrich Karl, 1781-1846. They both served their country ably and resolutely until their deaths. I was struck by how closely the prince on the left in the Plate resembled George Prince of Wales. Of course, the German family history was nearly connected, and the nose, chin, and mouth display a shared lineage. The artist of the portrait from which the Plate was made (which was commissioned by the King of Prussia) is not disclosed, unfortunately. He is merely noted as "celebrated" and "eminent". The engraver, on the other hand, is listed as Bolt, a name unknown to me. The group portrait was an amalgamation of individual portraits done for this specific purpose. The Plate is so evocative of its era, and offers so much history and personality in a single picture. I feel so fortunate to have found it.